Everyone coming to the American Tropics wants to see a toucan. 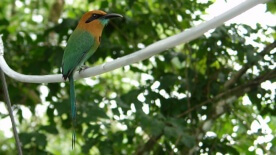 They are among the most colorful and bizarre looking birds in the forest. Some species have bills longer than their bodies. Toucans use those bills to reach fruit and berries from thin branches. Their bills are hollow but extremely tough allowing toucans to defend themselves from predators. Ecologists consider toucans among the most important seed dispersers in the rainforest. 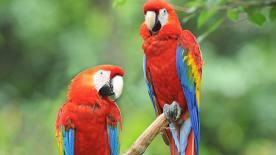 Toucans prefer to eat very eat ripe or even rotten fruit. The seeds of the well-ripened choices have a much higher germination rate. 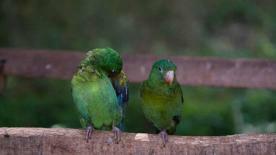 As these tropical birds spread more and more seeds, the opportunity for the seeds to grow becomes greater. Toucans are cavity nesters. They pilfer woodpecker holes for nesting and roosting. One of the funniest things to watch is five or six toucans squishing into a small woodpecker hole, one on top of the other. They are so fixated on taking over the hole, they stack themselves up, one on top of the other, like a tropical totem pole. 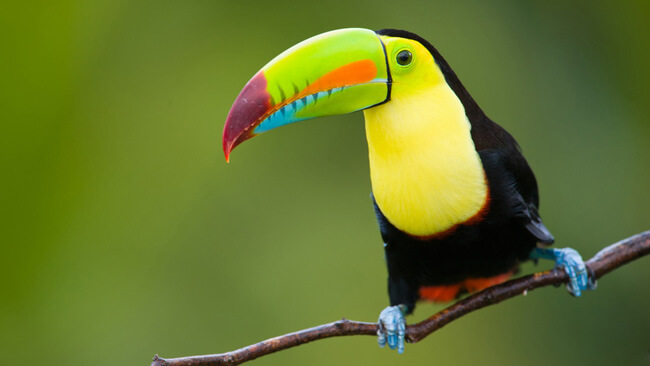 In Costa Rica we have six species of toucan, and they can be found in all the habitats: the Emerald Toucan and the Yellow-eared in the cloud forest; the two Aracaries (fiery-billed and collared), the Black mandible and the Rainbow-billed or keel-billed Toucan, all of which have a wide distribution throughout Costa Rica. During your next visit to the tropics, listen for their distinctive calls and for trees with ripe fruit, and you’re bound to spot a toucan.